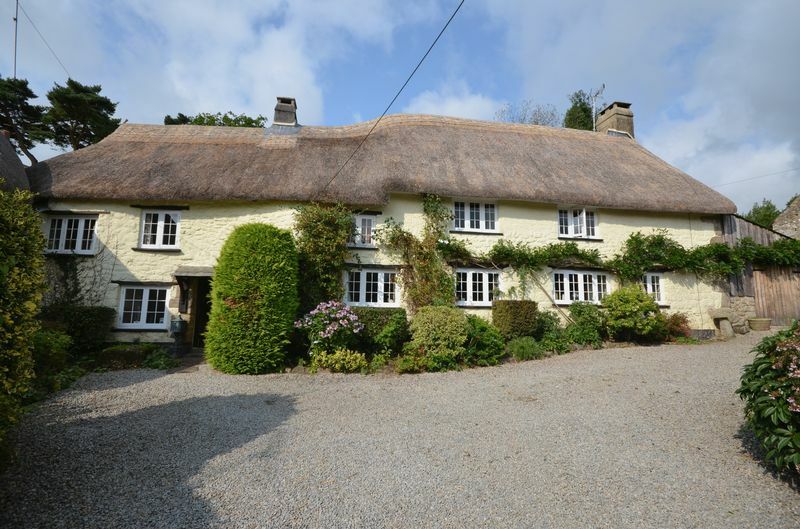 Dating back to the 16th century, Murchington Farmhouse is a large granite house with a recently combed thatched roof. 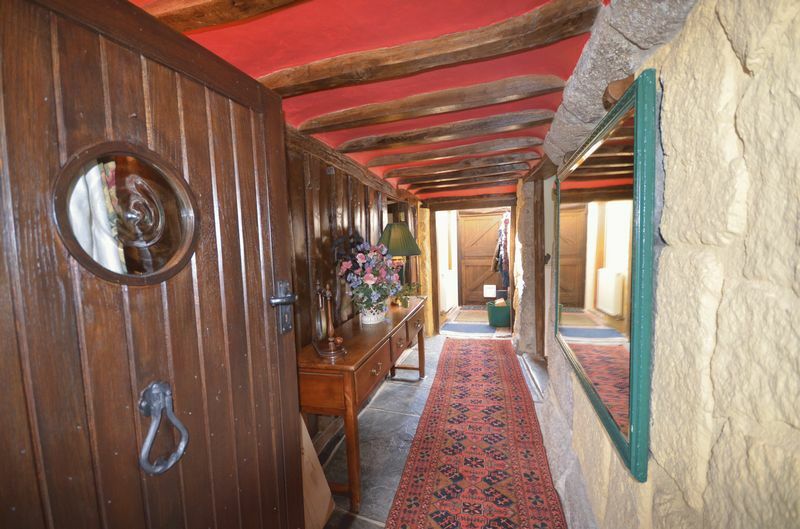 The Property is spacious and full of character, very well presented with 3 reception rooms with an additional sun room, study, a kitchen with an Aga and an original cross passage. Upstairs there is a large master bedroom, 3 further double bedrooms and a studio or an extra bedroom. There is also 2 bathrooms both of which have showers. Outside there is ample parking to the front, a large attached single garage and a superb garden with a long southern boundary. Fowlers strongly recommends a viewing to appreciate this lovely house. 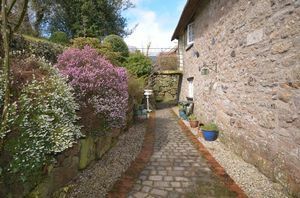 Murchington is a quiet village about 1 mile from the ancient stannary town of Chagford, on the gentler side of the moor just above the Teign Valley. 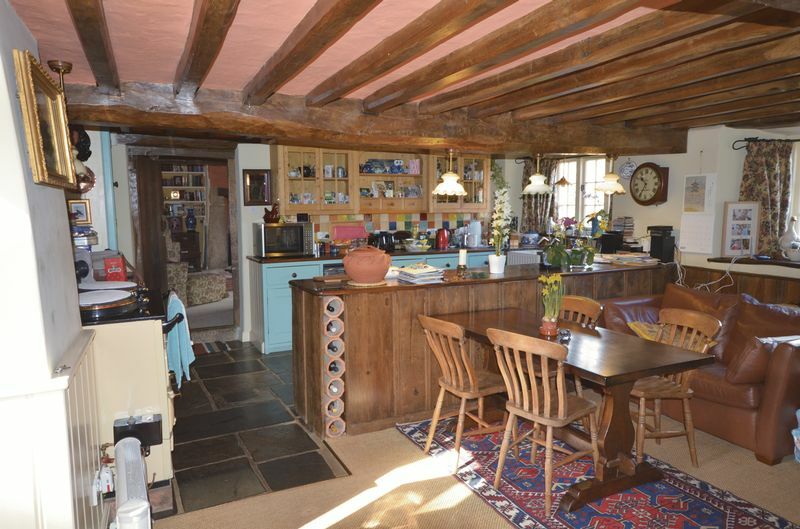 Murchington Farmhouse is off the public highway in an ancient cluster of granite-built houses. It is set behind its own gated entrance. 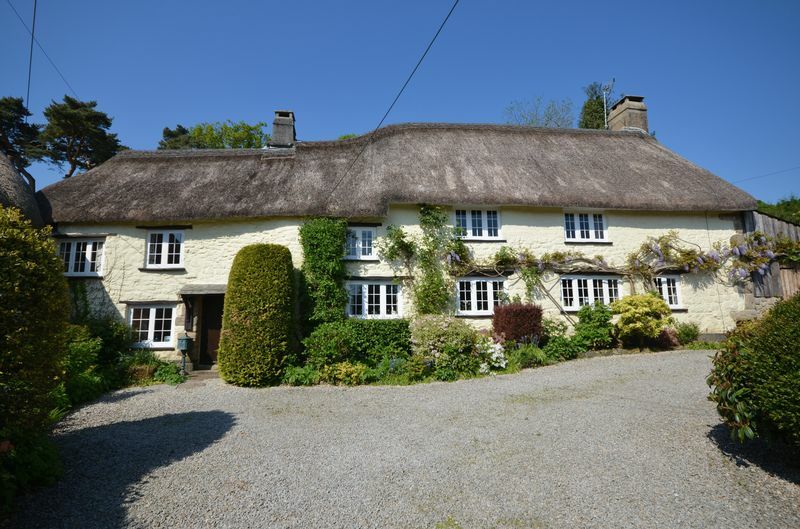 Nearby Chagford has a wide variety of day to day and specialist shops, a primary school, preschool and Montessori. 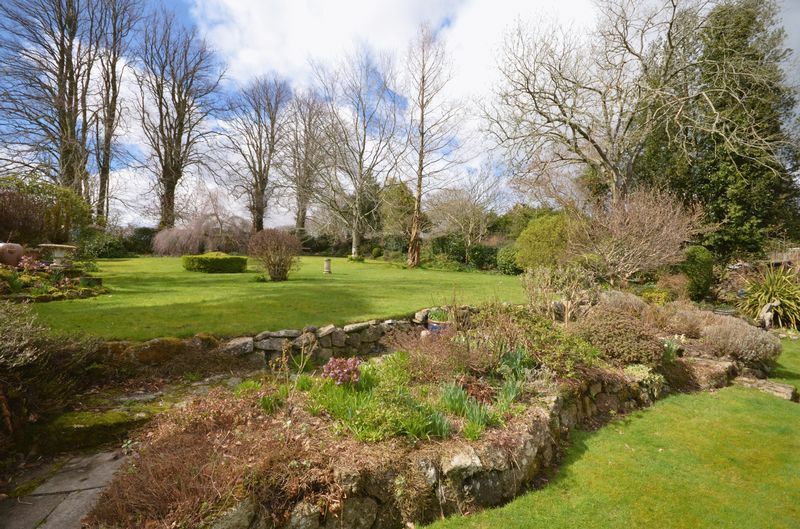 Chagford also has plenty of places to eat and excellent sports facilities, including a football and cricket pitch, bowling club, tennis club and an open-air swimming pool in the summertime. 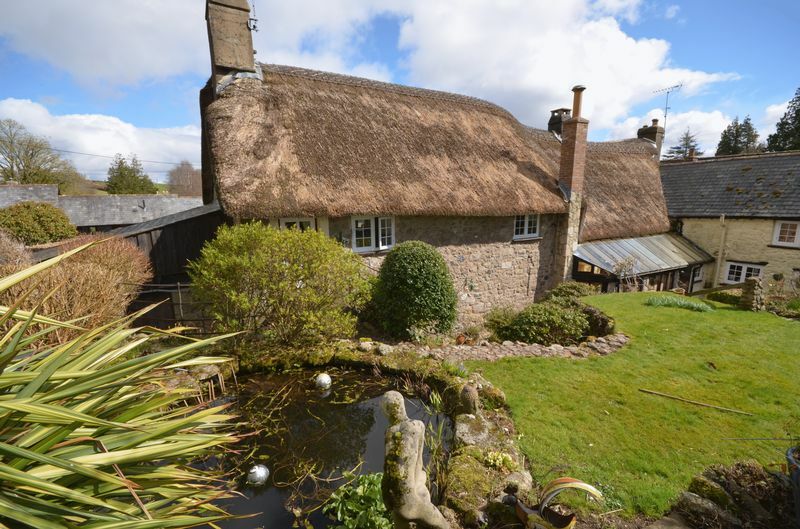 Murchington is surrounded by countryside, riverside and moorland walks, yet the A30 dual carriageway is only 5 miles away and Exeter is around 20 miles away. A slated canopy porch shelters the broad oak front door which has a bulls eye porthole window, a wall mounted carriage lamp and a brick and granite threshold. With granite to one side and a beautiful wooden plank screen to the other, the cross passage has a slate flag floor, two wall light points and latched doors to the kitchen/breakfast room, dining room and w.c. At the far end is a brick floored porch with a door to the lower rear patio, a double panel radiator and space for coats and boots. This has a brick floor, walls tiled to waist height, a fitted low level w.c. and a wash hand basin, a single panel radiator and a glazed rear window and glazed roof. A granite sill leads from the cross passage into the kitchen/breakfast room. The room features a large granite fireplace with a granite hearth, copper hood and bread oven. There are also two very large structural beams spanning the room with exposed joints. A window and doorway open to the sun room at the rear and there are two large windows to the front with oak sills. The breakfast end of the room has wainscotting to waist height and a latched door to the presently unused granite spiral staircase. A TV point is located in the corner of the room and there is a telephone point and two wall light points. The kitchen end of the room has a cream oiled fired Aga with multi coloured tiled splash backs. The kitchen is set on a slate flag floor. The cabinets are solid wood and painted with richly hued oak work surfaces with a granite drainer surrounding a Belfast sink which has a pair of brass taps. Space is allocated for a fridge, freezer and dishwasher. Worktop lighting is fitted and there are five pendant lights in brass stems. A latched door leads to the sitting room. 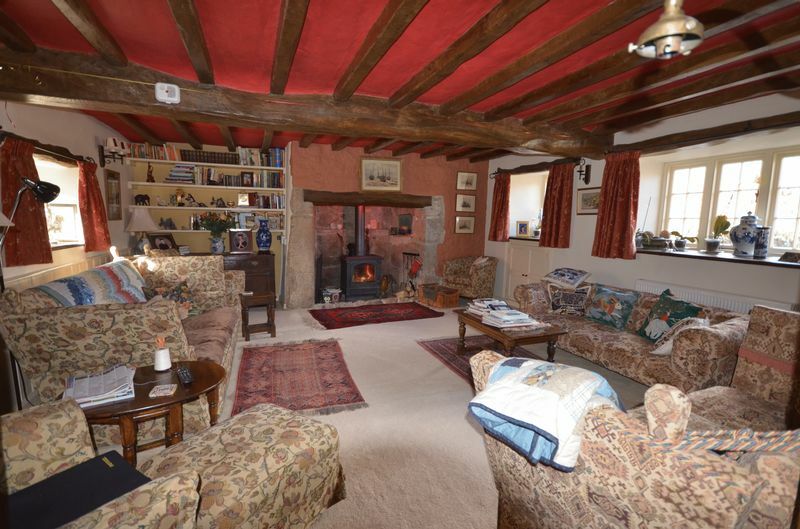 This is a spacious room with a large granite fireplace with a bread oven, oak bressemer beam, a woodburning stove with a lined flue and a granite hearth. There are two large front facing windows with oak sills and a smaller rear window. Bookshelves are fitted, there is one wall of waist height wainscotting, a big structural beam and exposed joints and two double panel radiators. Five wall light points are fitted, a TV point and some built in cupboards which can conceal a TV. A bright room off the kitchen/breakfast room. It has a glazed ceiling, terracotta tiled floor, a broad bank of glazed windows with timber framing, a glazed roof, a single panel radiator and one wall light point. A step leads down from the cross passage to a decent size dining room, with space for a large dining table and dressers. It has a front window and two side windows, two large structural beams with exposed joints, five wall light points and a pendant light point. 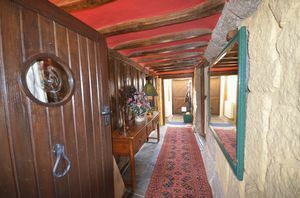 This side of the wooden plank screen has feature painted plaster work and at the far end of the room is a single panel radiator and an opening to the hall and stairwell with three granite steps. A bright hallway with a 20th Century staircase and good natural light from a landing skylight. 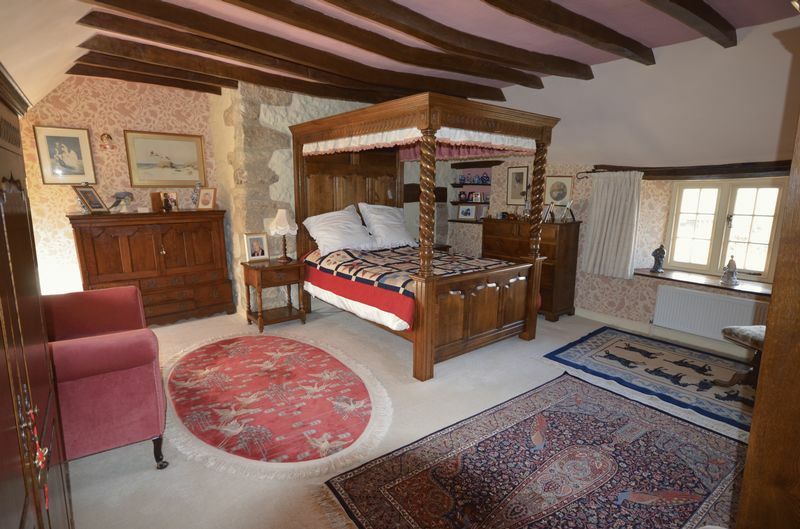 There is one wall light point, a feature plaster and oak wall, an under stairs cupboard, some wainscotting to waist height and a glazed portcullis style door to the study. Two windows look out to the lower patio and there is a double panel radiator, two wall light points and a large built in cupboard in a former fireplace which has an oak lintel and mantle shelf. A structural beam spans the room and joists are exposed. 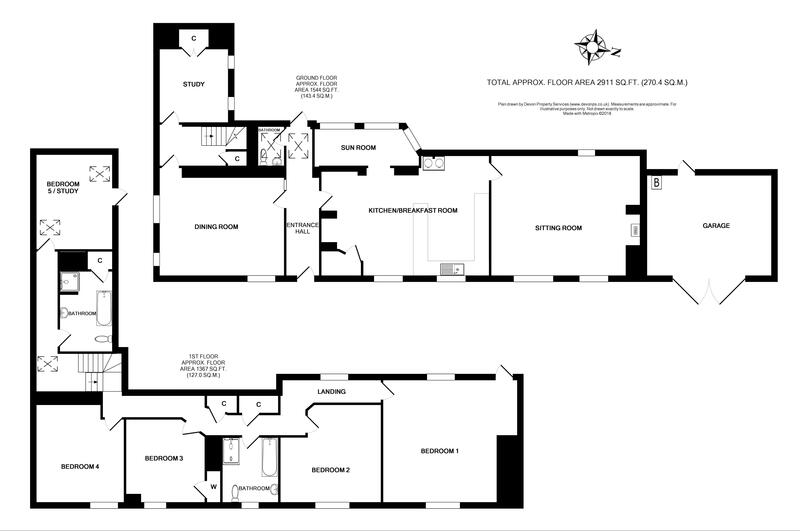 The first floor is multi-level and has a corridor to four of the bedrooms and a bathroom. A shorter passage leads to the second bathroom and the studio/5th bedroom. A heritage double glazed skylight lets in plenty of light and there is a painted balustrade, a double panel radiator, exposed roof trusses and oak latched doors to all rooms. There are three wall light points and two eaves storage cupboards. This bathroom has tiled walls highlighting the exposed oak timbers and trusses. It has a fitted white bath with brass fittings with a matching low level w.c. and wash hand basin. A tiled shower cubicle is fitted with a glass screen and sliding door with a built in shower, downlighter and extractor fan. A shaver point is fitted and there are three wall light points. 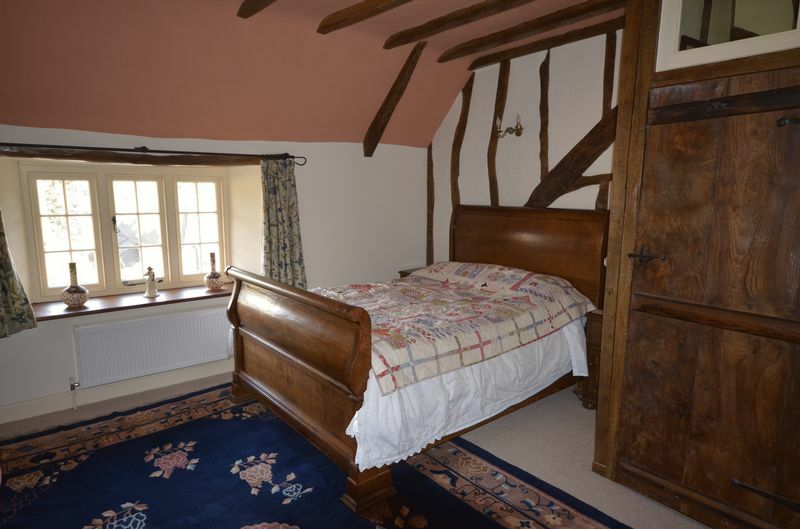 A generous second bedroom with a window to the front and a deep oak sill. 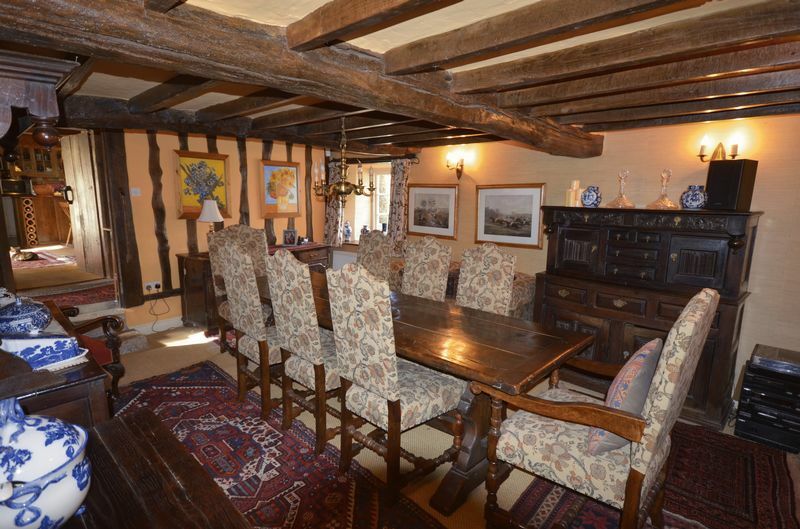 There are two feature plaster and oak walls and other exposed timbers. The room has four wall light point and a double panel radiator. A spacious and airy room with a large front facing window and oak sill, as well as a large rear window and a glazed door to a bridge leading to the upper garden and pond. 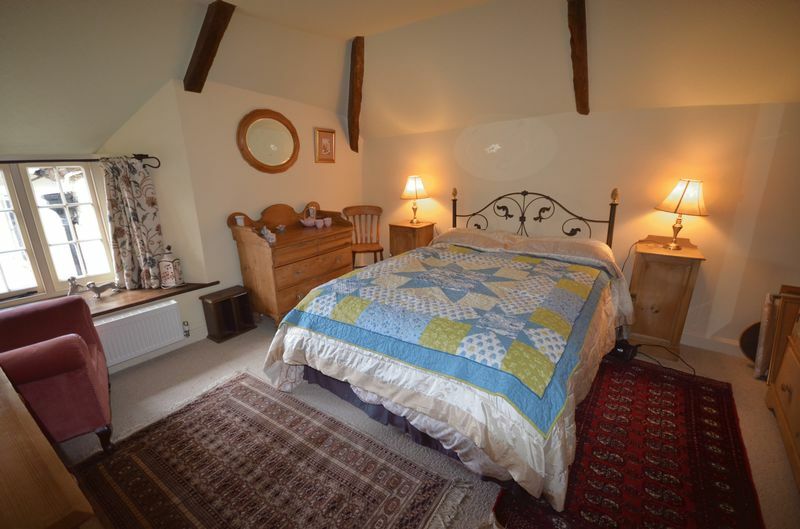 The room has a large granite former fireplace and exposed structural timbers. There are three wall light point and a double panel radiator. Fitted with a pressed steel bath in white with painted wood side panels, a low level w.c., a pedestal wash hand basin and a fully tiled shower cubicle with a built in thermostatic shower, a downlighter/extractor fan, a single panel radiator, two ceiling lights and a wall light above the sink with a shaver point. A window overlooks the lower patio. 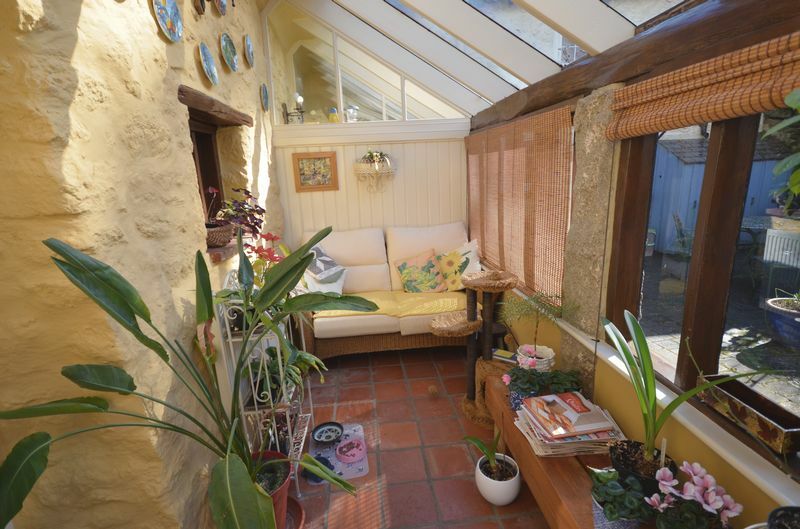 This is a bright room with two heritage double glazed skylights and a glazed portcullis door to the upper garden. The room has a double panel radiator, six halogen downlighters and painted granite walls to three sides. 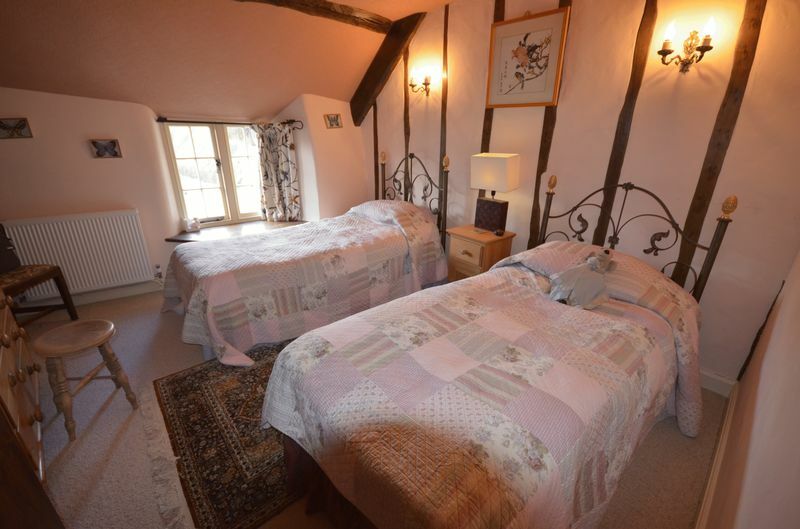 A good size double room with a front facing window and oak sill, two wall light points, a double panel radiator and two feature plaster and oak walls. A double room with front facing windows and oak sills, two wall light points and an exposed granite wall with a latched door to a closet adjacent. (If the floor of the closet were removed then the granite spiral staircase from the breakfast room would be usable again). One of the bedroom walls has plaster and oak features. Broad oak double doors lead into the garage which has a ceiling mounted spotlight fitting, a concrete floor and space for a washing machine, dryer and the two year old Grant oil fired central heating boiler. A pedestrian door leads to the rear path and the back of the house. A large metal gate and posts are at the entrance to Murchington Farmhouse and lead to a large gravelled parking and turning area. There are some hedgerows to the boundaries of the property and raised shrubberies and borders. A large and mature wisteria adorns the front of the house. 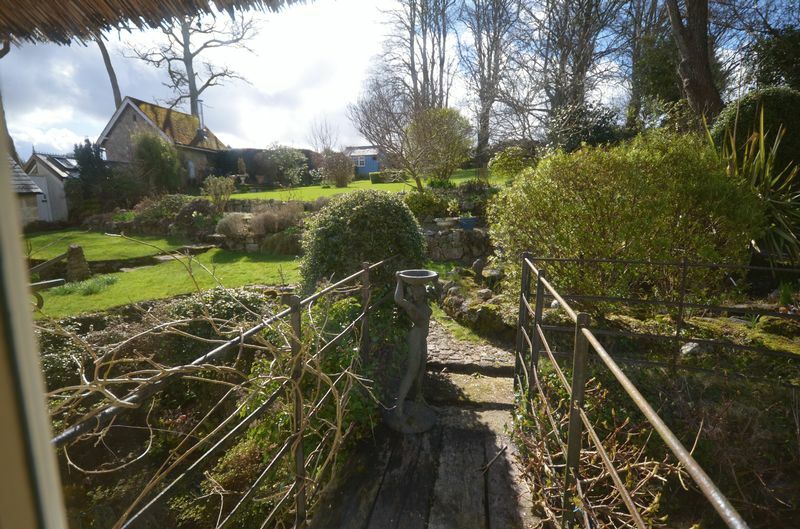 To the immediate rear of the farmhouse is a broad brick and paved pathway and a lower patio. 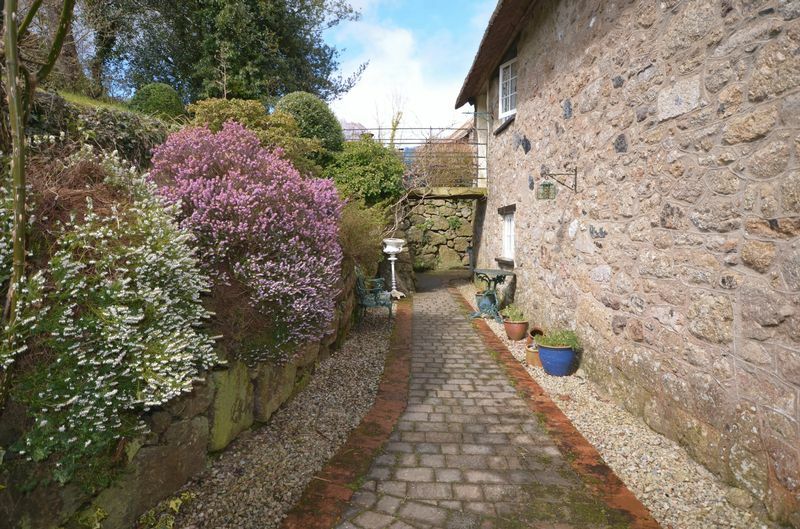 The pathway has granite walls on the garden side and leads across the rear, connecting the rear porch with the garage pedestrian entrance. Granite steps lead to the front terrace where the pond and adjacent patio with steps to the main garden lie. 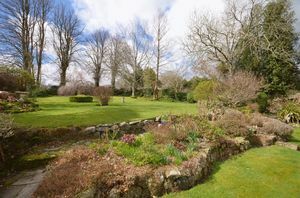 The main garden is laid to lawn with mature tree and well stocked borders. It enjoys views to Nattadon and Meldon hill. There is also a blue timber shed which has power and light. Water is a private borehole and drainage is a community run septic tank. Mains electricity. From Fowlers go to the top of the Square and turn right into Mill Street. Follow Mill Street for about 150 metres and then bear right into the continuation of Mill Street. The road drops down through a granite cutting and when it levels out turn right at the cross roads. Drive through the bollards and over the granite bridge, then take the first turning on the left. This winds up and downhill and takes you to a T junction into Murchington. Turn left and after about 150 metres take the driveway on the left. Continue along until you reach the gateway to Murchington Farmhouse.